Upon Jack Russell's death, at the age of 88, his stock was scattered. It is doubtful that anyone today can trace a terrier back to Trump. Rev. 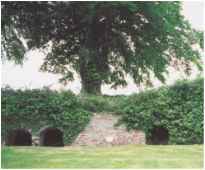 Jack Russell's original kennels—this is where the Jack Russell Terrier began. These kennels were built from rock left over from the building of the railroad bed, and were located about 200feet from the back of his home. in homes of nonsporting people. Others who did not conform correctly for earth work, perhaps having too much blood of other breeds, were kept by people who found they were useful above ground for the task of rodent control. Some of these dogs had short, bandy legs and barrel chests. 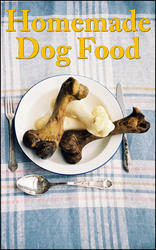 They may have carried some Dachshund or Bull Terrier blood. Many of these pet strains came to the United States with fanciers who brought them from England. With them also came fine examples of the hardy, well-conformed working terrier so favored by the Reverend Russell himself. Fortunately, while the show-ring Fox Terrier continued to develop—and change—devoted fans of the original Fox Terrier continued to happily breed and work their tough little dogs in both Britain and North America. 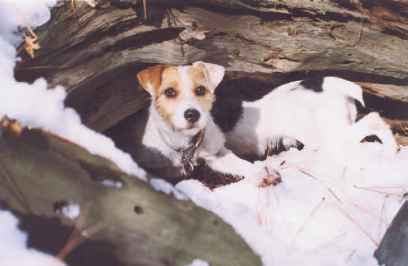 During this time they were still called by many names: hunt terrier, white terrier (after their extinct ancestor), and working Fox Terrier. But as Greg Mousley, a noted terrier man and world authority on Jack Russell Terriers, relates, "Parson Russell was an extrovert and a flamboyant character and in his role as the sporting Parson he became very well known. Along with his fame went the awareness of his terriers, and when the Fox Terrier Club was formed, a name was needed for the many thousands of white bodied working terriers belonging to the working terriermen of the day, in order to distinguish them from their Kennel Club counterparts." They became known as Jack Russell Terriers.